On April 5, Luciano Ducci, the mayor of Curitiba, Brazil, boarded the world's largest urban bus on its inaugural ride across town, marking yet another coup for the city's transportation system. Powered exclusively by biofuels (made from soybeans), the 92-ft.-long (28 m) megabus can carry 250 passengers at a time and makes just four stops along a 6-mile (10 km) route. With a projected fleet of 24 vehicles, the system will ferry an average of 25,000 people per day. Curitiba may be the original smart city. In the early 1960s, it was plagued by sprawl and congestion. Architect Jaime Lerner responded with the Curitiba master plan, an urban-design strategy whose centerpiece was an affordable and efficient transportation system. Adopted in 1968, the master plan became the cornerstone of Curitiba's design  and Lerner went on to become mayor. One of the hallmarks of the city is its public-private partnerships. In the 1970s, for example, Curitiba was fast approaching 1 million residents, the typical threshold for installing a subway system. However, the price tag was an unaffordable $300 million. Lerner presented the private sector with a unique solution: with the government, build a rapid bus system that would have all the amenities of a subway  speed, reliability, affordability and frequency. Companies would invest in the fleet of buses, and the government would chart the itineraries. The result  the bus rapid transit (BRT) network  became the world's first metronized bus system. More than 2.3 million people per day now travel on it, and Curitiba has the lowest level of atmospheric pollution in Brazil. 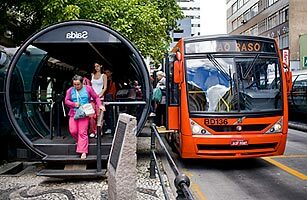 At least 83 cities worldwide have copied Curitiba's BRT system. As rural populations rush into urban areas, the challenges thousands of cities face are congestion and traffic. In China alone, 350 million people will migrate from villages to cities by 2030. In Guangzhou, one of the fastest-growing cities in China, the BRT system carries 800,000 passengers a day and has cut the average commuting time in half. Major cities in the U.S. are also paying attention. On April 15 the Chicago Transit Authority approved a $1.6 million grant to explore introducing a BRT system along Western Avenue. One can only hope that New York City will make a similar move. Curitiba's busy system actually resembles a subway, with exclusive transit lanes, prepaid-ticket counters and bus sensors that communicate with smart traffic lights, allowing buses to move along at continuous speeds. Heavy traffic is endemic in the Middle Kingdom. That's why fast-growing cities like Guangzhou are adopting the BRT system to carry hundreds of thousands of passengers a day more quickly.